For me, this kuih is both intriguing and perplexing at the same time, and first is of course the name. 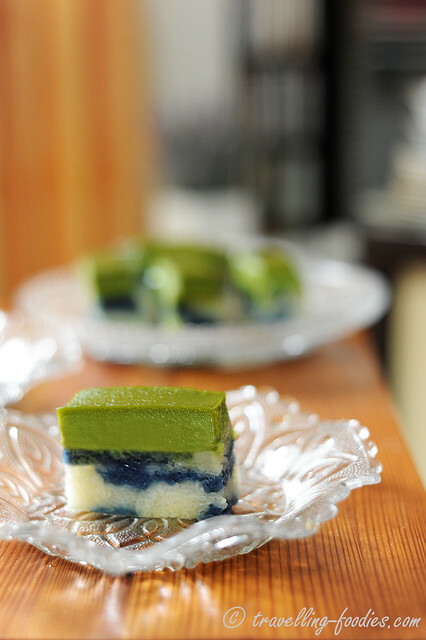 In fact, it goes by more than one name…Kueh Sarlat , also spelt as Kueh Salat is the name favoured by the Peranakans, It is however better known to the larger Malay community as Kuih Seri Muka or simply Seri Muka to mean “pretty face”. And the folks in Melaka would find this more familiar as Gading Galoh while other variations include Puteri Sarlat and Kueh Serikaya. Now what else is there about it that is intriguing and perplexing? Secondly is of course the cultural signifance it bears. As Kuih Seri Muka, it is one of the “100 Heritage Foods of Malaysia“. Not an “easy” feat considering Nasi Kandar didn’t get in. *chuckles* But personally, I’m more intrigued by the “pantangs” i.e.. taboos it entails. While this is commonly enjoyed as a breakfast or tea-time snack by many now, it was prohibited from being served so casually by the Peranakans of the yesteryears. The blue, white and green version made with daun pandan and bunga telang (Clitoria ternatea) bears the colours one would associate with funerals and mourning. Thus, one would never find it being served during festive occasions or important dinner gatherings like the Tok Chuchi Mulot (Baba Malay for “cuci mulut” ) that accompanies a Tok Panjang. “Cuci mulut” is a nickname given to sweet desserts being enjoyed as a “palate cleanser” bearing contrast to the savory dishes being served during the Tok Panjang, a classic Peranakan long table feast where “Tok” means table in Hokkien while “Panjang” means “long” in Bahasa Melayu, with both words being borrowed into Baba Malay. Instead, a similar version named Pulot Serikaya made with just an egg custard dyed yellow is served. Yet another intriguing detail is the use of flour in this recipe. While some older folks and traditionalists/purists claim that an “authentic” kueh sarlat never uses flour to set the top pandan kaya layer, every established cookbook on Straits Chinese cuisine written by the “doyens of Peranakan cooking” which contains a recipe for this kueh that I’d encountered so far incorporates flour of some sort in the batter. So is the use of flour something to be avoided or is it just a tall bibik’s tale, well, I’m not too bothered really. I’m perfectly fine with using flour as long as it gives me good results, i.e.a kaya layer that is really custardy and smooth, yet just barely firm enough to hold its shape when I cut it. And then is the use of the juice from bunga telang as a coloring. This seems to be a exclusively found in the versions made by the southern Peranakans in Melaka and Singapore, and not in the Malay version of “Seri Muka”. 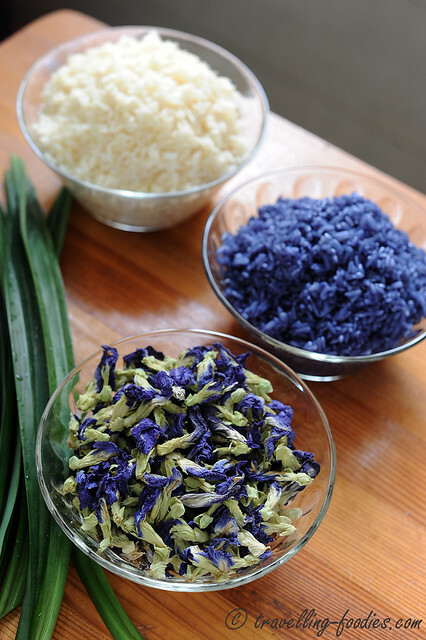 Most recipes call for the coloured juice “extracted” through boiling blue butterfly pea flowers in water to be drizzled onto the glutinous rice while it is being steamed. Been there done that and I find that the finished product was somewhat lacking in the vibrancy and contrast compared to the kuehs I’d had at Restoran Nancy’s Kitchen in Melaka. I remembered vividly that the colour contrast between the blue and white was really distinct. Not only that, each grain of rice was individually coloured with no smudging or “blurred out effects” whatsoever. That could only mean one thing, the colours were not created from a mere superficial splattering but worked into the “bones”. It had been set into the grains through soaking the glutinous rice in bunga telang juice. A mere drizzling simply wouldn’t get the colours worked all the way into the starch and intensify the colours so much. All that was needed was some experimentation to prove the point and true enough, after a good night’s soak each individual grain turned out a glorious and rich zaffre by morning. 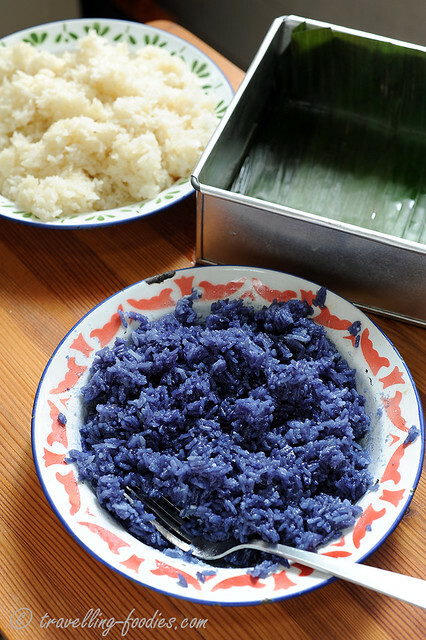 By now, each rice grain is soaked thoroughly with the blue pigment from bunga telang juice but the colour is not set. So the two parts of colored and uncolored glutinous rice have to be steamed separately. 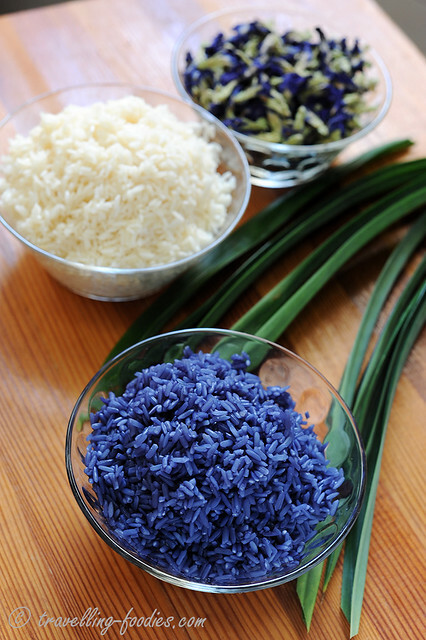 Steaming them together would only allow the bunga telang juice from the blue grains to leach into the coconut milk that has been poured over the rice and in turn get absorbed by the white rice grains, producing a graduated effect. But that is not exactly what I had in mind. While waiting for the glutinous rice to steam, we can work on the batter for the top kaya custard layer so no time is wasted. I’d used 100% pandan juice for both the colour and the flavour. Absolutely not artificial colouring is required. 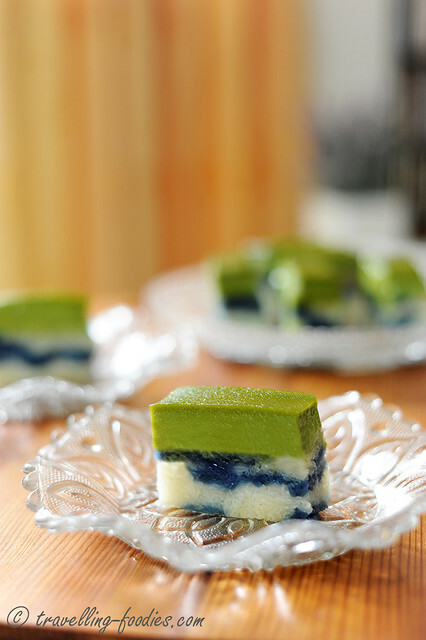 And contrary to what Kitchen Tigress had mentioned in her blog post, it IS possible to obtain a satisfyingly green serikaya layer without using pandan essence or daun pandan serani. One simply needs to know how much pandan to add. tekan tekan tekan… the rice has to be pressed down until it is very very compact. This can be done using the back of a spoon or otherwise, the “penekan kek” as I’d used, which is customarily meant for making kek lapis legit. Whatever that works best for you! Then we return to work on the custard layer by heating it over a water bath until the custard just starts to thicken. This happens when the water bath reaches above 85 degrees Celsius and one has to be careful not to allow the water to boil rapidly as that meant the temperature was too high and would cause the custard batter to thicken too much. Unlike the bottom glutinous rice layer which was steamed over a strong fire, the top custard layer has to be steamed over barely simmering water. The water must not be allowed to boil continuously, building up pressure very slowly that is being released as the occasional bubble that rises and pops at the surface. This slow steaming process allows the custard layer to set more evenly, thus preventing the formation of bubbles on the surface of the custard or huge air pockets gathering within. And the traditional way with a steamer uses a large towel wrapped over the cover to catch any condensation which might otherwise drip onto the surface of the kueh thus “disfiguring” it. That said, do not be too fascinated and caught up with trying to get a perfectly smooth surface. Bengawan Solo’s version has a really undulated surface though I must say that their Kueh Sarlat tastes rather good despite its lack in appeal! 25g plain flour, for a slightly firmer custard texture which is more manageable for first-timers, flour can be increased to 40g. (1) In a saucepan, place water and bunga telang in it and bring the water to a boil before turning down the flame to low. Allow to simmer slightly with lid on for 3-5 min before turning off flame and steep for 10-15 min. Leave to cool down slightly before use. 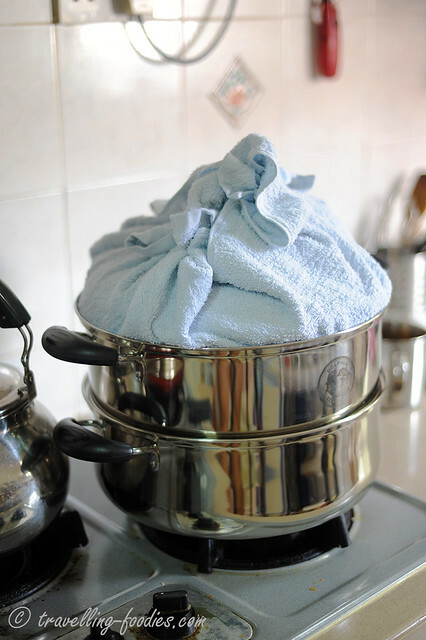 It may help to sit the pot on a folded wet towel to cool it down more quickly. 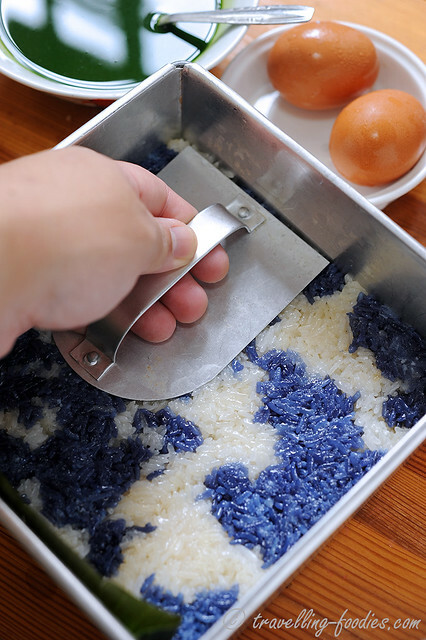 (2) Rinse the glutinous rice to remove excess starch and impurities present, until water is reasonably clear. (3) Divide the washed glutinous rice into 3 parts. Place 2 parts in a bowl and add water until rice grains are completely submerged. Place the remaining last part in a separate bowl and add bunga telang juice over it. Top up with some water if necessary, ensuring that all the rice grains are covered in the blue liquid. (4) Leave both bowls of soaked glutinous rice to sit for at least 6 hours, preferably overnight. (5) Drain the glutinous rice that had soaked overnight and spread out onto two separate plates for steaming. 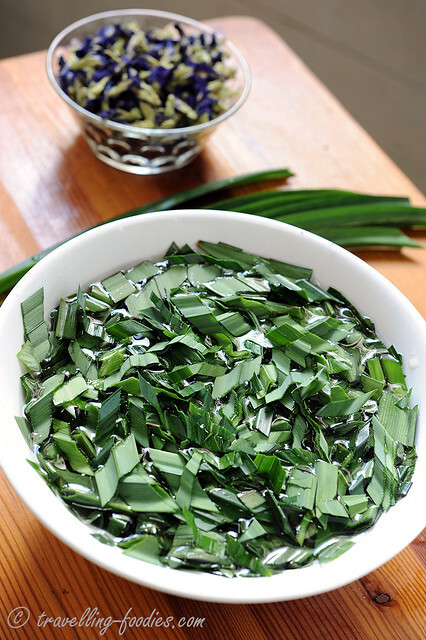 Crush or shred the pandan leaves slightly and stuff them between the rice grains. (6) Add salt to fresh coconut milk and give it a good stir. (7) Divide the coconut milk into 3 parts, and drizzle 2 parts into the plate with “white rice” and one part into the plate with “blue rice”. Stir thoroughly to combine coconut milk with rice grains. (8) Place the plates into a steamer and steam at high heat for 20 min. 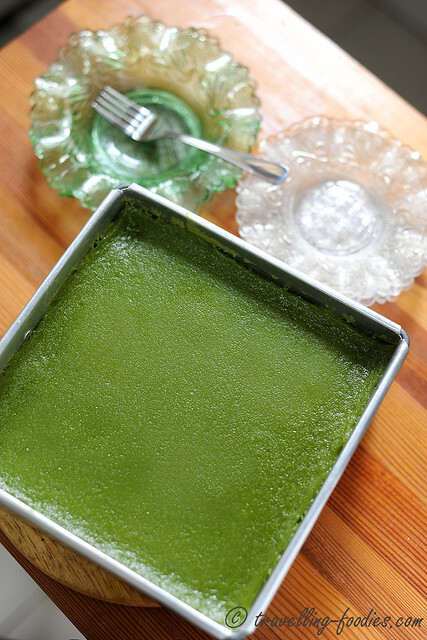 (10) Drain the pandan juice over a fine wired sieve or better still muslin/cheese cloth and squeeze as much juice out of the pulp as possible. It should yield more than 100 ml of concentrated pandan juice. (12) When the pulot is done steaming, combine the two parts into a slightly greased 6″ square tin and press down with a “penekan kek” (kek lapis legit press) or the back of a sturdy metal spoon. Ensure that the rice layer is very very compact, especially around the edges and corners. Place the tin into the steamer and top up the water in it if necessary. Turn on the heat to get the steaming started over medium-low flame. (12) Return to work on the custard layer, strain the mixture in (11) into a heat-proof or metal bowl and sit this bowl over a pan of gently simmering water. 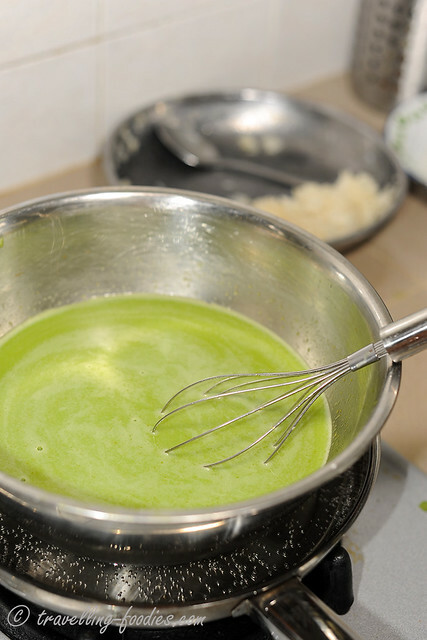 Stir continuously until custard just begins to thicken. Note that the custard batter should still be very fluid and not viscous. (13) Pour the slightly thicken custard mixture carefully over the rice layer in the square tin and steam very very gently over barely simmering water until the custard layer sets. It should take appro. 25-30 min. Wrap the lid with a large towel to catch any condensation. (14) Leave the kueh to cool completely (about 6 hours) before unmoulding and cutting. Yes the recipe may sound a bit daunting and tedious but when you figure out the work flow as described and the process should be quite smooth flowing. Enjoy! I am submitting this to the Little Thumbs Up “Egg” event organized by Bake for Happy Kids, my little favourite DIY and hosted by Baby Sumo of Eat Your Heart Out. This entry was posted on August 22, 2013 by Alan (travellingfoodies). It was filed under Food, Simple Eats and was tagged with Baba, gading galoh, kueh, Kueh Salat, Kueh Sarlat, Kueh Seri Muka, Kueh Serikaya, kuih, malay, malaysia, Nonya, Nyonya, Peranakan, Puteri Sarlat, Seri Muka, Singapore, straits chinese. This is best looking Seri Muka I have seen todate, and thanks for sharing such a comprehensive knowledge of the makings of this kueh. Very nice! Will follow your advise on colouring separately instead of drizzling the bunga telang liquid! Thanks for sharing! Wa…I envy you…I wish I could make this too 🙂 Thanks for sharing recipe and the tips. Will want to try this one day. This looks so time consuming but I’m sure the effort’s worth it! Thank you so much for sharing good recipes. You are indeed very talented person because by looking at your recipes, all of them were so meticulously cooked. All your recipes are indeed keepers and I shall try them out when I have the time. God bless you. May i know where can i buy the bunga telang? Your kuehs with bright blue hue look very pretty. I have managed to grow some blue pea flowers and frozen them but haven’t do anything with them yet. Love to make kuehs as pretty as yours! Wow Alan I’ve never been too interested in Asian desserts until I started reading your posts! If I ever get around to attempting one of your recipes, fingers crossed they’ll come out half as good as yours! Hope to see your Asian dessert creations one of these days! Tried yr kueh salat recipe. It is nice!!! But my green layer n rice layer.slightly taller using 6″ tray. Could it b my rice is not firm enough? I tried to make yr kuih salat for the 2nd time last week. This time was more successful. My families said it is very nice. Btw, i think i prefer lower kuih. Can i use 7″ tin insteadi? Yr cutting of the kuih is so even. How did u do tat??? Made this twice and making it again tomorrow. great to know! hope you liked the recipe, Helen! Many thanks for sharing tour recipe. I followed closely and It is laborious. Just to share, I think the kueh is too sweet, perhaps reducing thr sugar to 120g or 100g will be better? I am not capable of modifying recipes. In fact, I used a 7″ x 7″ tray but I measured all the ingredients according to your recipe. Another point, my kueh was not cooked after 30 minutes of streaming. I had to resteam it another 2 times before the custard gets firmer. So I think the steaming took about 50 minutes to 1 hour. Many thanks for sharing your recipe. I followed closely and it is laborious. Just to share, I think the kueh is too sweet, perhaps reducing the sugar to 120g or 100g will be better? I am not capable of modifying recipes. In fact, I used a 7″ x 7″ tray but I measured all the ingredients according to your recipe. Another point, my kueh was not cooked after 30 minutes of streaming. I had to resteam it another 2 times before the custard gets firmer. So I think the steaming took about 50 minutes to 1 hour. Thank you for sharing your recipes and comprehensive instructions! I have a soft spot for nonya kuehs and food made with coconut. I have been hesitant about making kuehs, which can be daunting, and most recipes do not actually give you much success on my previous attempts. Peranakans are known for guarding their “secrets” jealously….without any offence intended. I must say that after attempting your 2 recipes (Kueh Sarlat and Onde2), I was delighted with the results though I need to adjust the sweetness in my next venture. Lookng forward to trying out other recipes. Thank again for all this effort and being selfless in sharing!!! Love the details in your recipe. Looks daunting at first glance. But the details in method of cooking helped a lot. Attempted your recipe (and any kueh recipe) first time yesterday. The kueh salat turned out well for a first timer. But I noticed that the middle portion was harder to cook and set. I had to cook 30min twice. But the middle portion just won’t set. hmm… that is very odd. one reason I could think of is that the custard was not cooked sufficiently enough over the stove before it is pour over the pressed glutinous rice before steaming. Also the custard layer might have been a bit too thick, which may cause the layer to take a longer time to set. Thank u for your reply and advice. How do I know it’s cooked sufficiently over the stove? Hi. I would to clarify if this recipe is for a 6″ or a 7″ tin kueh? Bcos at the top of the recipe u state a 7″ tin. But in the recipe u ask for a 6″ tin. Thanks Alan for this recipe. I did it many times for my Husband and my Father. They loves it so much. My Husband and polish off 1 recipes in a day. Hahahaha. Ya that’s how much he loves Kueh Sarlat. Now no more buying it from bengawan. I saw your recipes for the 9 layer kueh. I must really try it out One day. 3 medium eggs, it’s whole of them or egg yolk only? Thank. “Eggs” are always understood as whole eggs. If egg yolks are called for in a recipe, it would have been specifically written as “egg yolks”. I was very impressed with your Kueh Sarlat and would like to try your recipe. Can I find out from you whether I can keep the leftover Kueh until the next day? We only have 2 family members so it might take some time before we can consume all…. Hi Lily, kuehs generally taste the best within the same day they are made. Especially so for kueh salat. The glutinous rice layer will harden with refrigeration but leaving the kueh at room temperature isn’t an option either in our wretched tropical weather. Thank you so much for sharing this recipe! Made using this recipe quite a number of times. I now can call it kueh salat, no longer call it kueh salah (as in the past, i dont yield the result i wanted) I’m becoming a fan of ur works. thank you! hi alan, do you usually sell your kuehs? and if you do, how much do you sell 1 tray (7×7 inch tray) of kueh salat for? I made this kueh many times and those who tried it keep asking for more. Thanks for sharing this fantastic recipe. CNY coming and i thought of double the recipe and make it in a 8″ round tin to share with more friends. Can u advise how long should i steam the kaya layer? Thank you for your step by step recipe for Kueh Scarlatti which I followed closely and the Kueh is the best I have tried. It turned out well! !